It's never been easier to put a razor-sharp edge on a knife. Just three or four strokes with the Easy Grip Sharpener will restore any blade to peak performance. The secret is a precision V-shaped tungsten carbide sharpening element in the head of the sharpener. 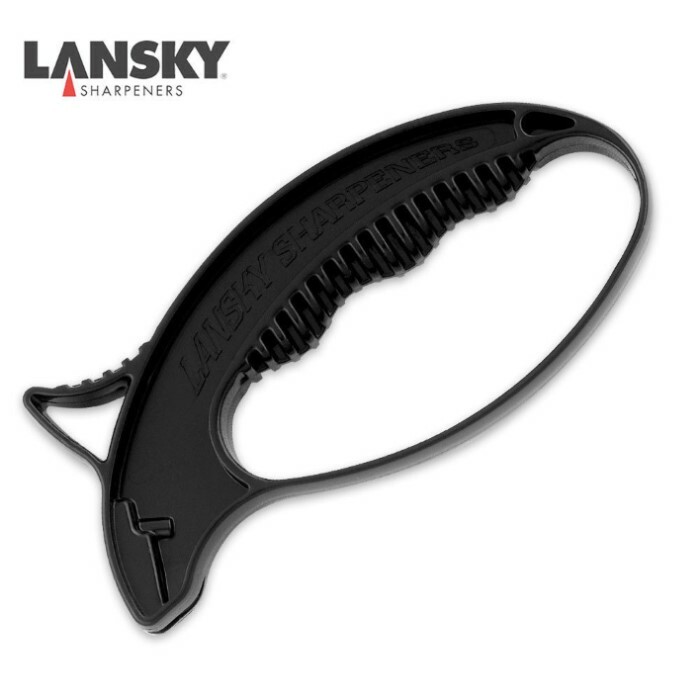 Designed with an ergonomic grip, finger guard and thumb rest, the Easy Grip Sharpener is both safe and comfortable. Its sturdy, but doesnt get the blade to sharp. Then again its sharp enough to do damage i would still buy it knowing this now. Not the most effective. Hand and easy to use but I can't help but thing its disposable. The top has a screw holding the actual sharpener in place, I one if i could get more tops. I'd like to bet more, or a different sharpener all together. Wasn't too bad though, it did actually sharpen the blades. Great sharpener, everything blade i own is razor sharp, including my ichigo inner hollow sword. WOOO! Excellent product and great price. Manage to get things sharp and I am able to cut things smooth like a baby's bottom...weird thing to compare..but..how do I say this, its a great deal and a great buy, your weapons will thank you. I thought this was a good sharpener. It does make your blades sharp, some knives take longer if they are not formed to the angle. I havn't yet sharpen one to a real razor, but enough to slice paper in half in mid air. The only CON I have, I feel this isnt for knives...Unless my product is just goofed. I think one of the sharpeners is offset a tad. When sharpening a blade, I was a direct centered 90 degree. One side of the blade was getting remove more than the other side, which makes me think we dont have a 45+45. Works well. But I would suggest buying an electric sharpner or have a ton of free time and love doing repetitive tasks. I sharpened a few knives around the house and went crazy and did a sword that took about two hours it got a good edge and my arm was sore for an hour afterwards. but what took me so long i did in a quater of the time with an electric one. Very nice its very good with swords maks even the dullist sword sharp. this item does exactly what it should do. all of my blades are vary sharp now. i great item. This thing can sharpen a sword so sharp; it can cut throgh paper super clean!!! OH YEAHH! !